VR is great for games and 3D films – that’s what it was designed for. However it is primarily a living room, office or seated experience, as you might bump into things if you walked down the street wearing a closed headset. It’s still a great technology with a ready and waiting user base of tens of millions among console, PC and MMO gamers, those who prefer 3D to 2D films, as well as niche enterprise users (e.g. medical, military, education). This has attracted a growing apps/games ecosystem around early players like Unity, Valve, Razer and others. AR is great fun for games, but maybe not as much fun as VR when true immersion is required – think mobile versus console games. But that possible weakness for gamers is exactly why AR has the potential to play the same role in our lives as mobile phones with hundreds of millions of users. You could wear it anywhere and do anything. Where VR is like wearing a console on your face (Oculus), AR is like wearing a transparent mobile phone on it (Magic Leap, HoloLens). AR could play a similar role to mobile across sectors, as well as a host of uses nobody has thought of yet. 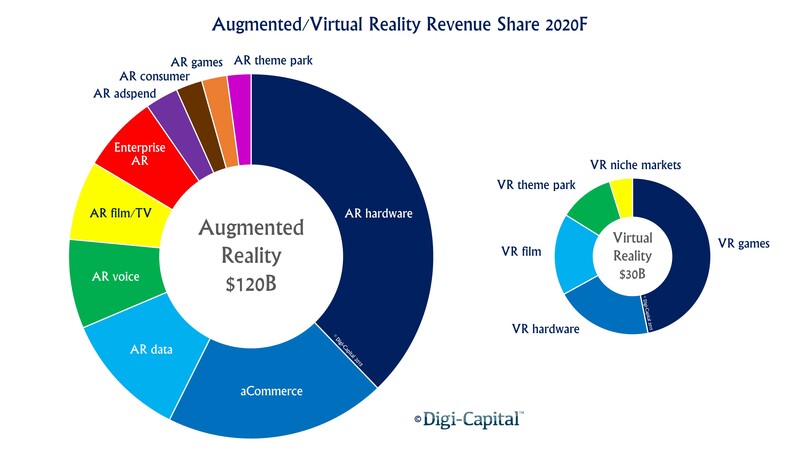 The sort of things you might do with AR include a-commerce (we just invented a new cousin to e-commerce and m-commerce), voice calls, web browsing, film/TV streaming in plain old 2D as well as 3D, enterprise apps, advertising, consumer apps, games and theme park rides. So while games feature prominently in most AR demos, they are only one of a multitude of potential uses for AR. See full analysis by sector here. 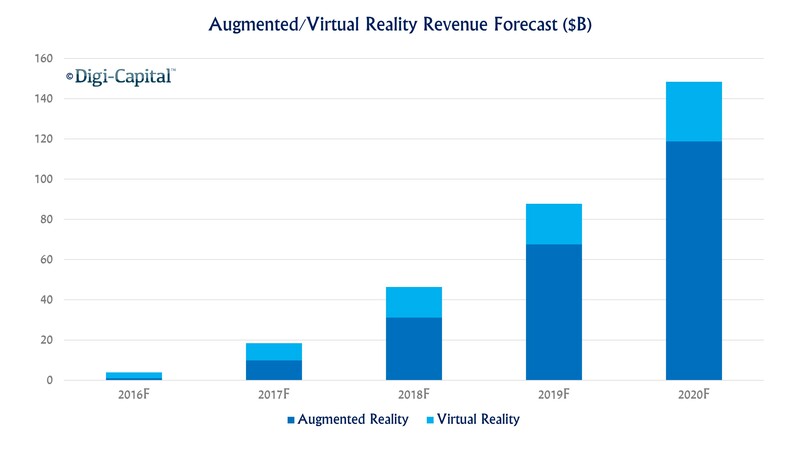 We forecast that AR/VR could hit $150 billion revenue by 2020, with AR taking the lion’s share around $120 billion and VR at $30 billion. The sector forecasts by market from 2016 are covered in detail here, and below is what the market could look like in 2020. Between now and then we’ll be refining regularly as more data becomes available, and expect a lot of debate about where the market is headed.